It was a gorgeous morning when I read this sonnet, and the image of the morning sun illuminating the world with gold resonated with me. Dawn and dusk are my two favorite times of the day, that threshold period when everything appears to transition. Carlos Castaneda claimed that these were times of heightened mystical power. I believe that. In this poem, Shakespeare uses the sun as a metaphor for the fair youth, who is the light of his life. There is a definite play on words, sun symbolizing son, representing the young man. When the youth is with him, Shakespeare’s world is transformed, and everything is gilded in gold. The image of the sun in the golden dawn is contrasted by the gloom when the sun is hidden by clouds. This symbolizes the time when the fair youth is absent from Shakespeare’s view. At these times, a shadow is cast upon the landscape of Shakespeare’s world. The warmth and brilliance are gone, replaced by a dull coldness. None of the other “suns” can replace his one source of light. They are all insipid in comparison. This is a wonderfully visual sonnet that expresses that deep love that is so difficult to convey through words. I hope you found this poem as beautiful and inspiring as I did. Cheers and blessings. I’ve waited two years for this book to come out. It is the third and final book in the All Souls Trilogy. I loved the first two books: A Discovery of Witches and Shadow of Night. I must confess, though, that this one was a little disappointing in comparison. Not that it was bad; it was just not as good. I have two main criticisms regarding this book. The first is that it felt drawn out. I kept waiting for something to happen. I found myself reading faster and faster just to reach the interesting parts. After about 300 pages, I was reading faster because I just wanted to finish already. I felt that this could have been incorporated into Shadow of Night by adding a mere 100 pages, but because publishers want trilogies now and it seems that every other book that comes out is part of a series. I suspect Ms. Harkness had to comply with her publisher’s demands and deliver the requisite pages. The second thing I found disappointing about this book is that it felt more like it belonged in the Twilight saga. It seemed to have less of the scholasticism, the history, and the rich description of cities that I found so engaging in the first two books. Instead, I suffered through pages of vampire/witch romance, which is really not that interesting for me. When the story finally moved to Venice, I was yearning for more description of the city and the architecture. I didn’t get it. In spite of my disappointments, the book is still good, just not as good as her previous ones. There were parts of the book that were brilliant and I have nothing but admiration for Harkness as a writer. As such, I definitely want to point out some strong points in this book. There is a great section that discusses dark magic. The term generally conjures images of evil and nefarious activity. But as the characters in the book explain, it is just representative of knowledge that is hidden and may be dangerous if mishandled. “Owls? Spiders? Bats? Dragons?” Sarah was using her teacher voice. At one point in the book, Diana is discussing alchemical texts with a library assistant. As she points out, the difficulty in deciphering an alchemical text is that the writers blend the physical with the symbolic, making it near impossible to figure out what is literal and what is symbol. “The Voynich manuscript’s illuminations of strange flora would certainly intrigue a botanist—not to mention the illumination of a tree from Ashmole 782. But why would an alchemist be interested in them?” Lucy asked. “Because some of the Voynich’s illustrations resemble alchemical apparatus. 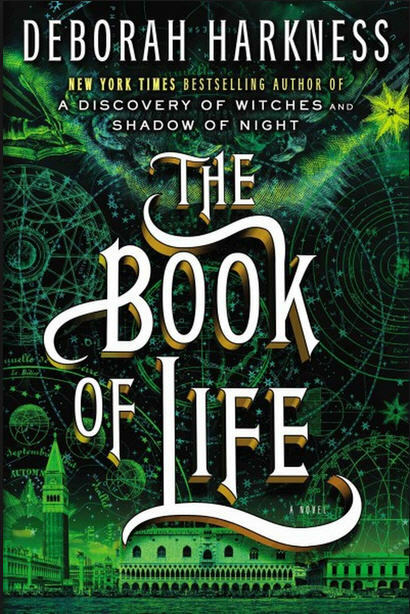 The ingredients and processes needed to make the philosopher’s stone were jealously guarded secrets, and alchemists often hid them in symbols: plants, animals, even people.” The Book of Life contained the same potent blend of the real and the symbolic. Since Harkness is a professor at the University of Southern California, her best writing, in my opinion, is when she is depicting the analysis of documents. I can sense the academic thrill of closely examining a one-of-a-kind document. Hubbard turned the page so that it faced me, but I already knew what I would see there: two alchemical dragons locked together, the blood from their wounds falling into a basin from which naked, pale figures rose. It depicted a stage in the alchemical process after the chemical marriage of the moon queen and the sun king: conceptio, when a new and powerful substance sprang forth from the union of opposites—male and female, light and dark, sun and moon. If I had to rate this book on a ten scale, I’d give it a seven. I think a lot of my disappointment was the result of the fact that my expectations were high. I cannot stress enough how much I loved the first two books, which was why I expected more from this one. I am also getting tired of the trilogy trend. Personally, I am feeling like I no longer want to read anything that is part of a trilogy. When I reach the end of a book, I want some closure. I don’t want to have to wait two or three years for the next installment, then struggle to remember the nuances of the characters and storyline. In fact, if I do decide to read a trilogy again, I will wait until all three books are out so I can read them one after the other.